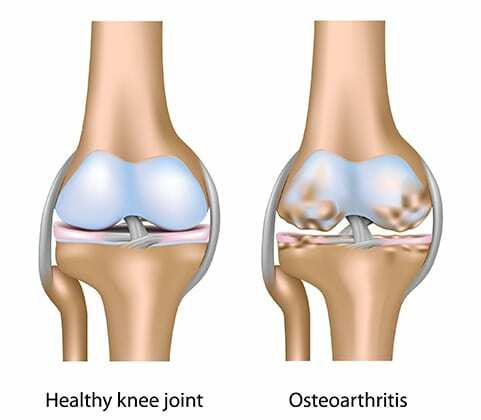 Osteoarthritis (OA), which is also referred to as a degenerative joint disease, is a common “wear and tear” disease that occurs when the cartilage that serves as a cushion in the joints deteriorates. This condition can affect any joint but is most common in the knees (see illustration), hands, hips, and spine. More than 50% of adults over the age of 65 are affected by a degenerative joint disease. This condition is associated with pain, loss of function, and reduced endurance, ultimately leading to weight gain and associated complications. The underlying cause of this condition is typically chronic repetitive motion that results in inflammation and structural joint damage. Predisposing factors include repetitive motion, infection, rheumatoid arthritis, muscular dystrophy, osteoporosis, hormone disorders, obesity, sickle cell disease, and bone disorders. OA is equally common in men and women before age 55 but increases in women thereafter. Higher rates are observed in the knees in women and in the hips in men. Patients may have pain, stiffness, limited range of motion, loss of flexibility, swelling, weakness deformed joints, and damaged cartilage. As the disease progresses, joint pain and discomfort that could be relieved with rest become persistent and can limit activity and reduce the quality of life. Physical examination will focus on the strength of the associated muscles and joint structure as well as the tenderness of the joint. Ability to walk and range of motion will be examined as well. X-rays, MRI, CT, or bone scans are imaging techniques used to diagnose OA. Fluids removed from the affected joints may be analyzed, and arthroscopy, which involves insertion of a small scope into the joint, can be used to view the damage. Rehab Management: Pain alleviation with acetaminophen, NSAIDs, topical and oral anti-inflammatory agents, Physical Therapy, and injection of corticosteroids or intra-articular hyaluronic acid injection for knee osteoarthritis lead to improvement. Weight loss if necessary and low-impact land or aquatic exercise are important features of treatment. Rehabilitation involves muscle strengthening and stretching around the diseased joints. Patients that participate in regular exercise tend to experience greater improvement. Medical Acupuncture has also been found to be helpful in managing the pain of knee osteoarthritis.